4:30am. I’ve never been one for alpine starts but climbing Castle Mountain is a big day. 1400m elevation gain and 13 pitches of beautiful rock. 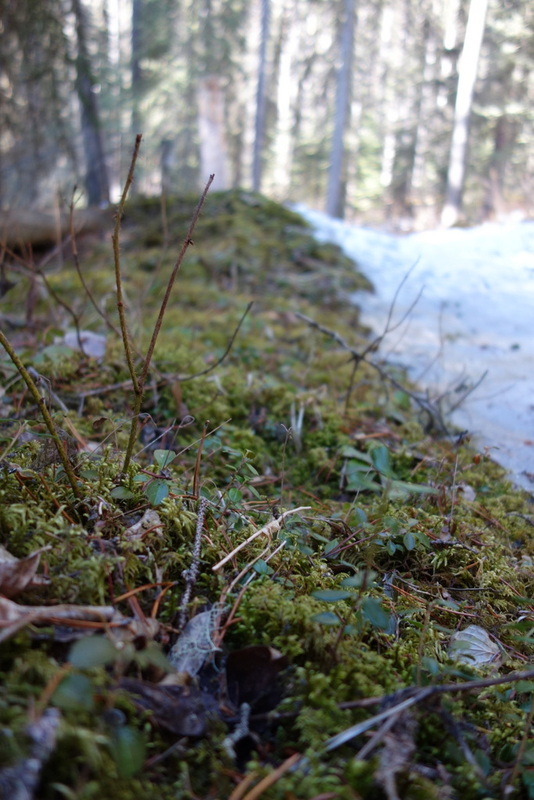 When the grass is turning green and the trees are starting to bud out, it’s hard to think of snow and snowshoeing. But this is one of the best times of the year to grab a pair and get high up in the mountains. The scenery is amazing. It’s still a winter wonder land. And the weather is gorgeous. It feels like summer. When else can you tramp through snow wearing shorts and a t-shirt? 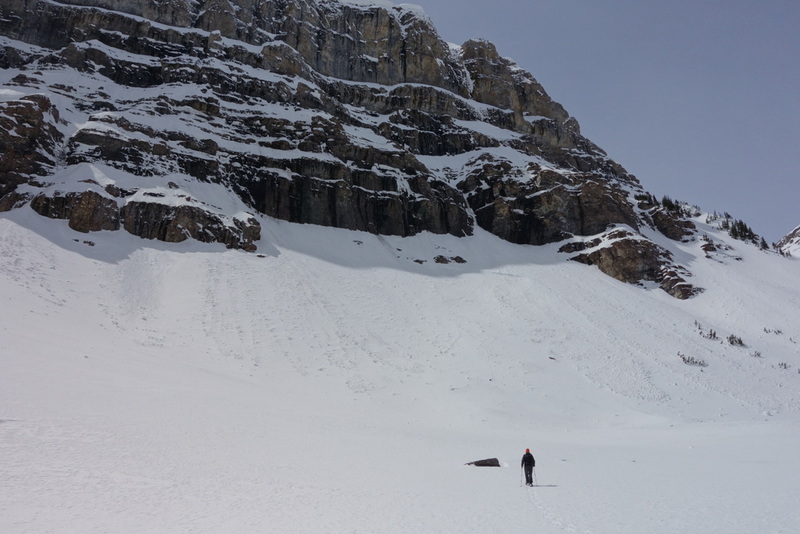 We hiked up to three alpine lakes – Lake Bourgeau, Rockbound Lake, Taylor Lake – and at Stanley Glacier we enjoyed a sweltering afternoon watching avalanches thunder down high cliffs. Who would guess it’s May? You see strange things in spring. Like the marmot who snuck up on Michael and stole his hat, then disappeared silently across the snow. As soon as I pointed it out, the marmot froze and Michael swore it was just a rock. 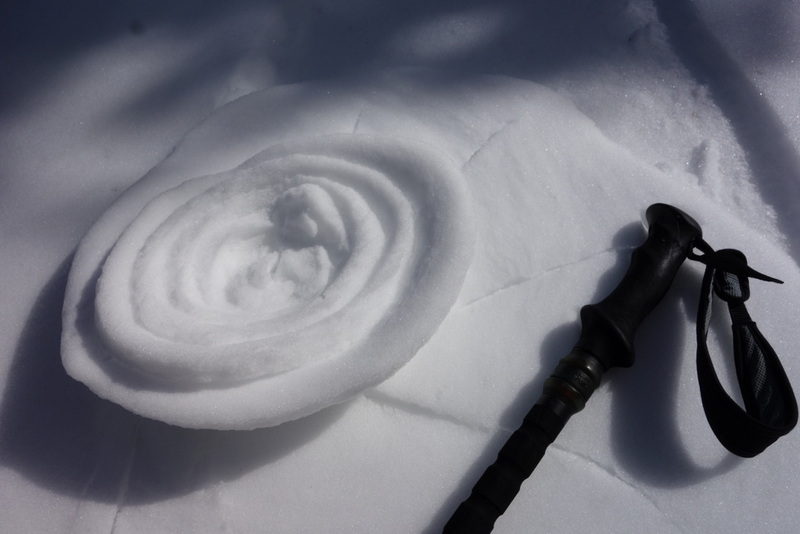 Then you see things like snow sluffing off a slope and somehow rolling itself into the shape of a cinnamon bun. Actually, as crazy as it sounds, it’s almost impossible to make a snowball and roll down a hill when the snow is this sticky. With visions of Indiana Jones in our heads, we’ve tried to push massive snowballs down steep slopes in hopes that they would crash through the forest and crush all the cars in the parking lot below. But they just roll up into fat, long cinnamon buns. Then – plump! – they splat heavily into the snow. Nothing can move them then. 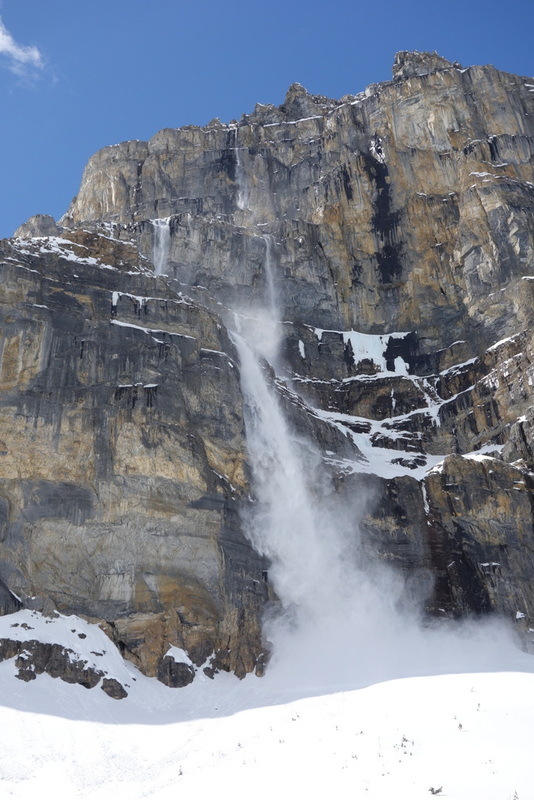 Nature does a much better job of hurtling snow over cliffs. As we got up into the alpine we thought we heard thunder. 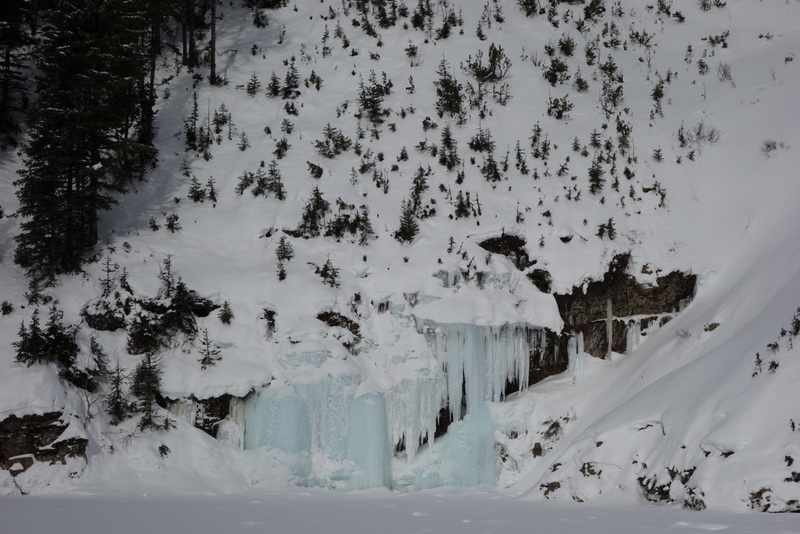 Only it was the intense sound of massive snow & ice chunks crashing down from the cliffs. This goes on all afternoon. It’s one of nature’s greatest shows. And it’s all free. 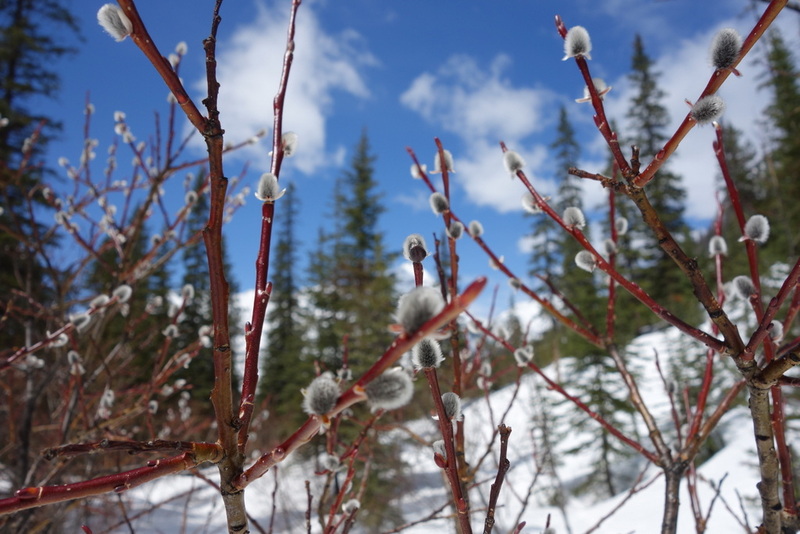 The best part of snowshoeing in spring is seeing nature come back alive. All shades of green start to return, adding colour to the deep blue sky and bright white ground. Birds sing and squirrels dart from tree to tree. Winter and summer mix together. 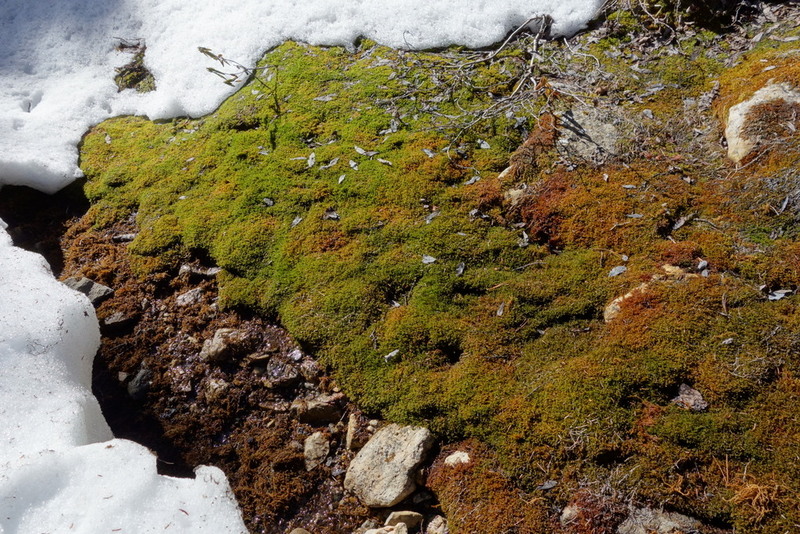 Minute by minute snow melts away letting even more life and colour appear. As nature transitions, so will we. 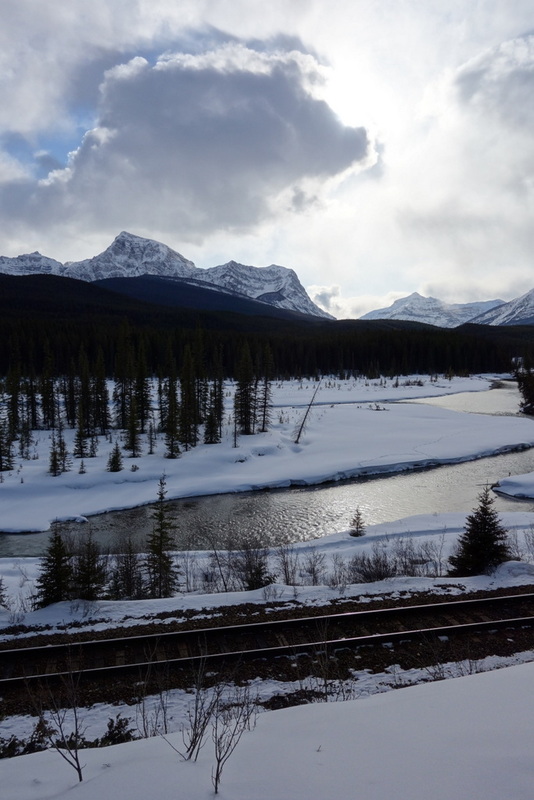 Soon, we’ll be packing away the skis and snowshoes and digging out the hiking boots. 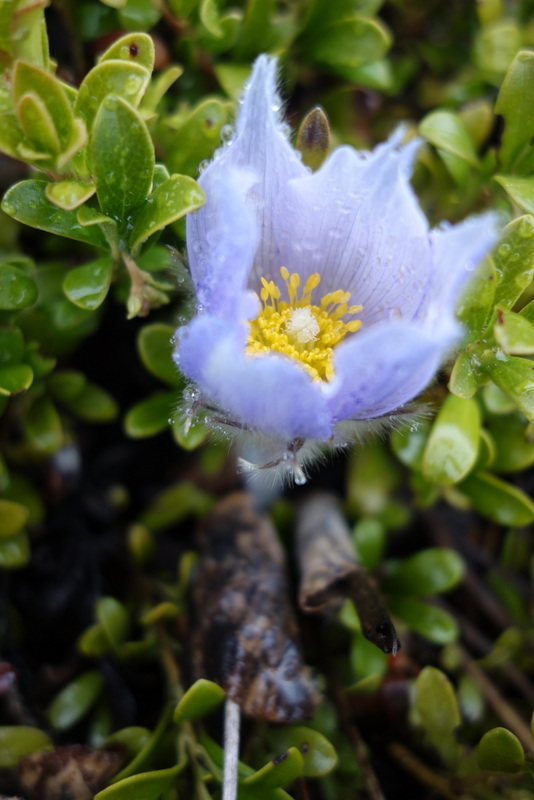 And as we wander through fields of freshly bloomed wildflowers we’ll be dreaming of the return of snow. I’m really happy that it’s warming up and spring is on its way. 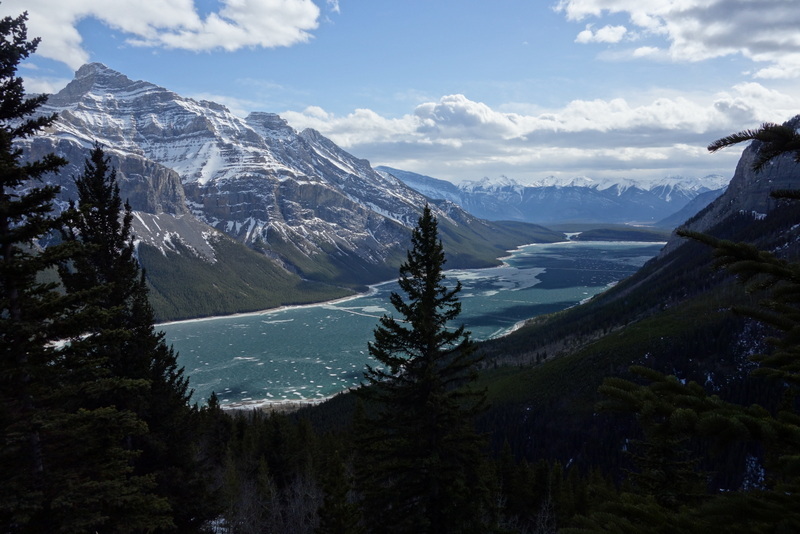 The best thing about spring is that the low-elevation trails in the Rockies are mostly free of snow and the forests are starting to turn a vibrant green. 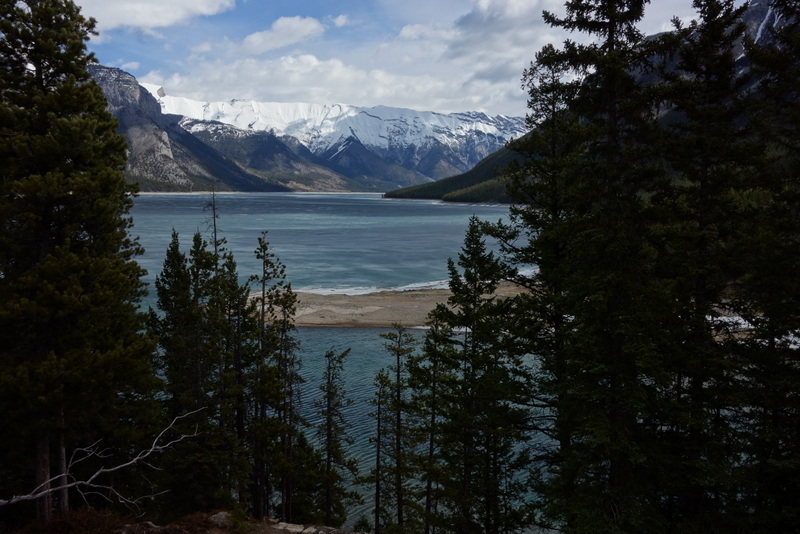 At the end of April I backpacked along Lake Minnewanka, a long reservoir that stretches out to wild Devil’s Gap. All together a journey of 60 km. 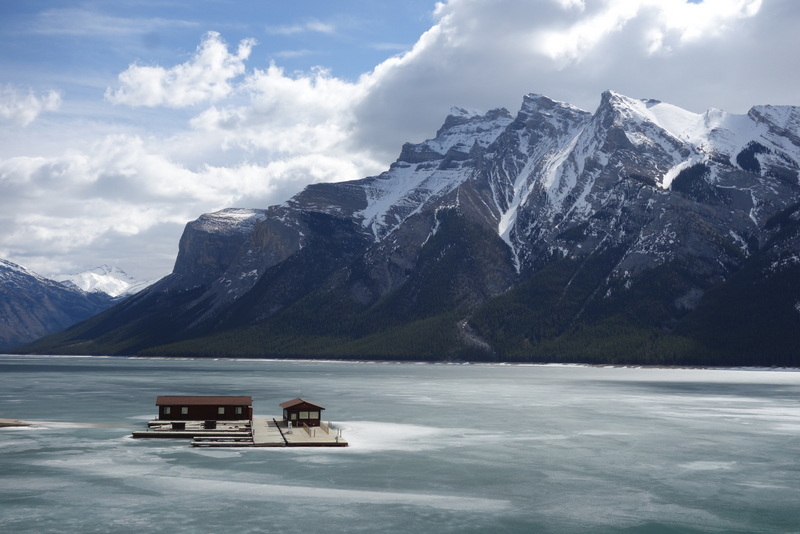 The first thing that struck me when I arrived at the lake is that it was still completely frozen. 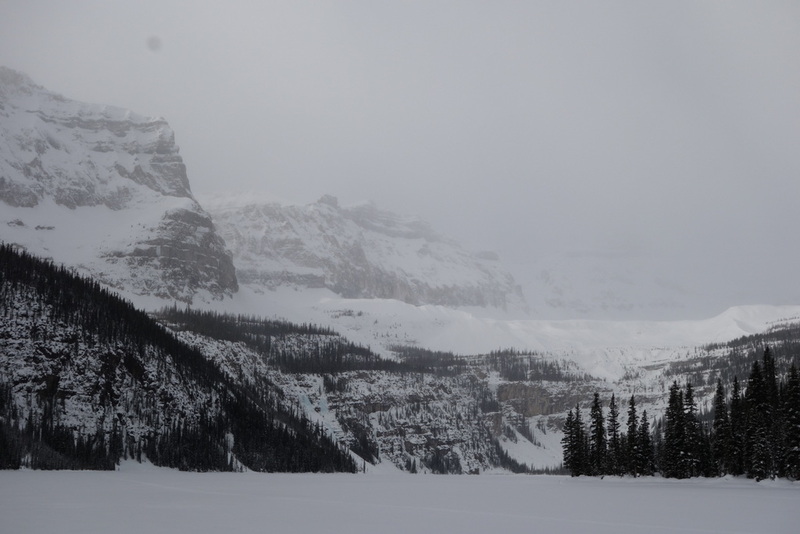 Even though the air was warm, walking beside a big frozen lake can get chilly. When the wind came up I really felt the cold air. I’ve decided to hike as much as I can in Vibram FiveFingers this year. I really like how you can feel the texture of everything you walk over. It’s a real pleasure when you go from walking on solid rock to soft dirt – something that wouldn’t stand out much in shoes or boots. It might have been a bit early to put on such minimalist footwear. The trail was quite icy and wet. 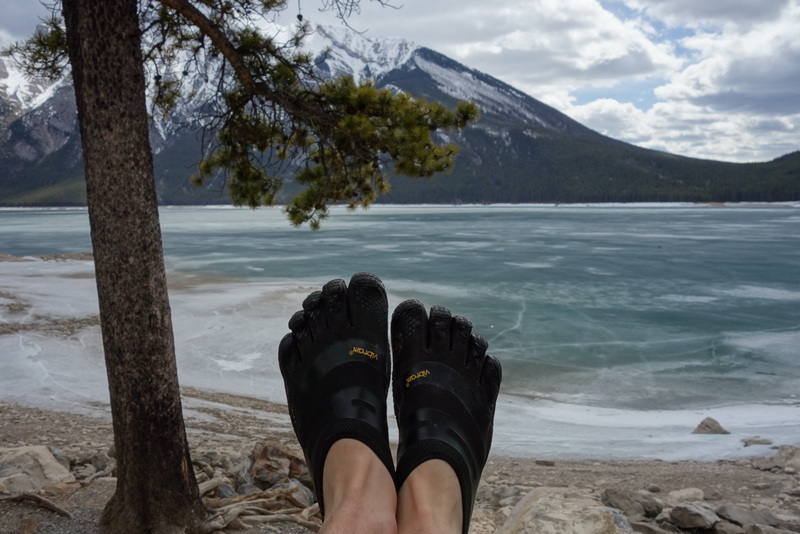 I found the FiveFingers gripped very well but my feet got cold quickly. As long as I kept moving fast enough, though, they were alright. After a few miles the ice disappeared and the trail was remarkably dry. 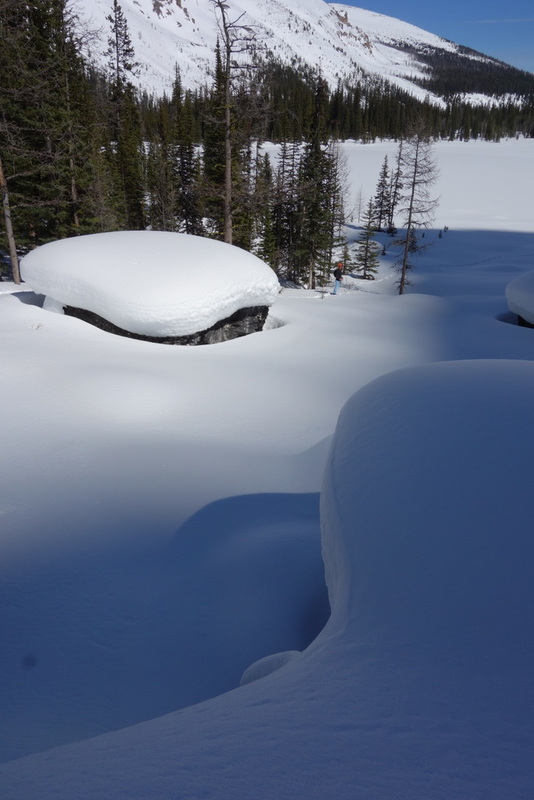 As soon as I left the lakeside and gained elevation, though, snow appeared and just got deeper and deeper. 500m higher at Aylmer Lookout I was punching through snow up to my waist and struggling to follow the trail. But worth all the effort for amazing views. 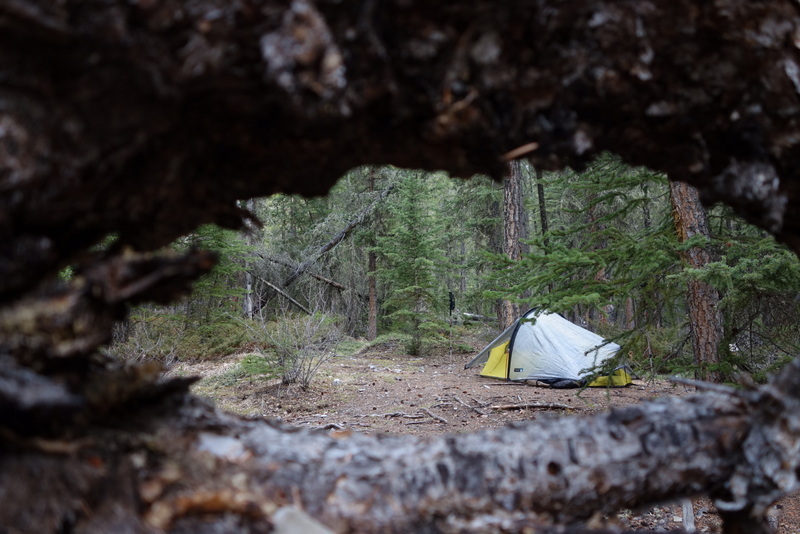 I made my first camp at the Mount Inglismaldie campground, although I could have camped anywhere along the lake shore. There was no one else around. It’s nice to be alone in nature, especially in an area that gets busy in summer. Getting drinking water was an unexpected challenge. 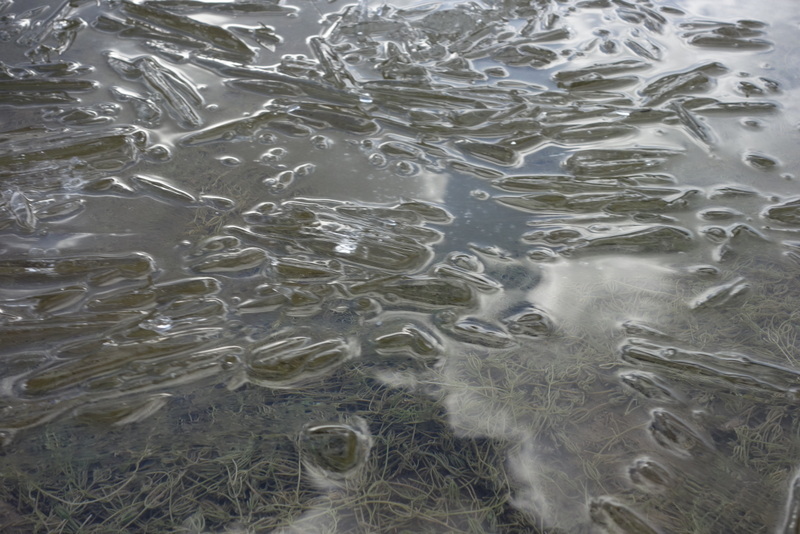 In summer there are a number of creeks flowing into the lake but these were all either frozen solid or completely dry. I had to resort to collecting lake water. But even that was a challenge. Only a few places along the shore had thawn out and those usually were separated from the forest by steep slopes of ice. When I did get to the water it was cold! I woke up to rain on the second day. A light rain that couldn’t decide if it might actually prefer to be snow. 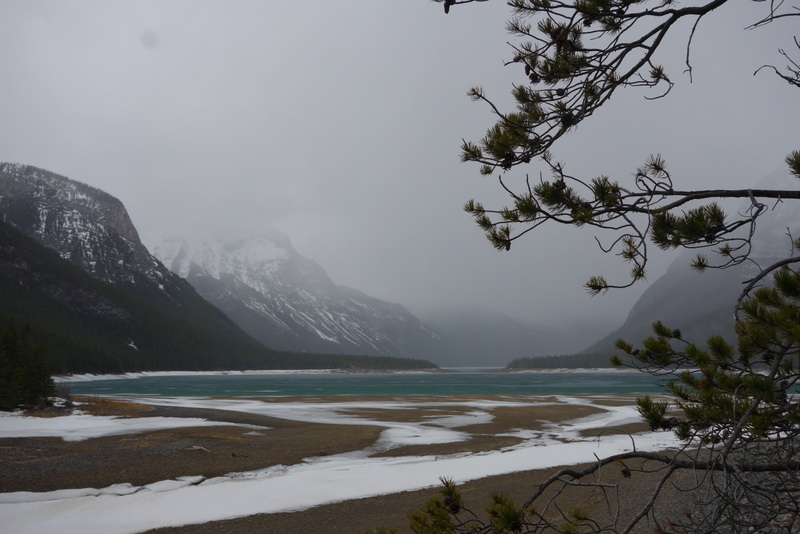 Secretly, I love hiking when the weather is nasty – cold, wind blowing rain in your face, feet wet. As long as you have enough chocolate it’s great. 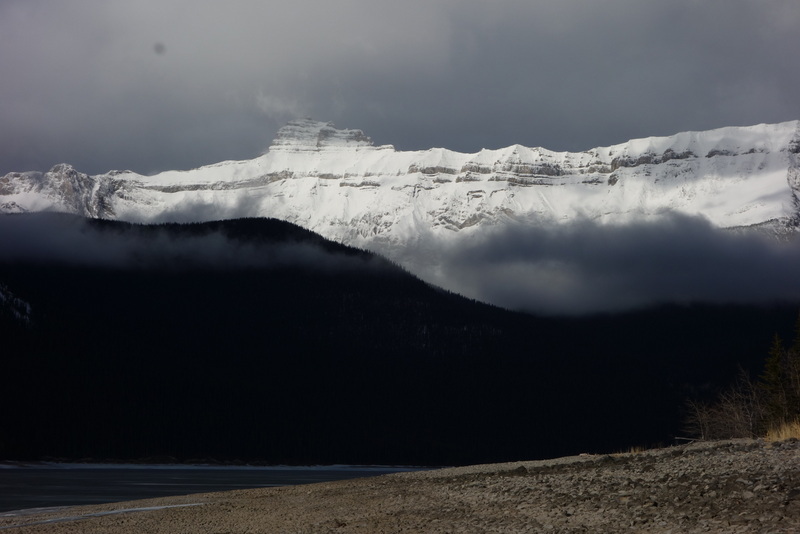 As I came to the end of Lake Minnewanka and continued toward Devil’s Gap the trail got much rougher and the scenery more wild. It’s ironic. You’re walking toward the prairie yet you feel as though you’re moving deeper and deeper into wild mountains. 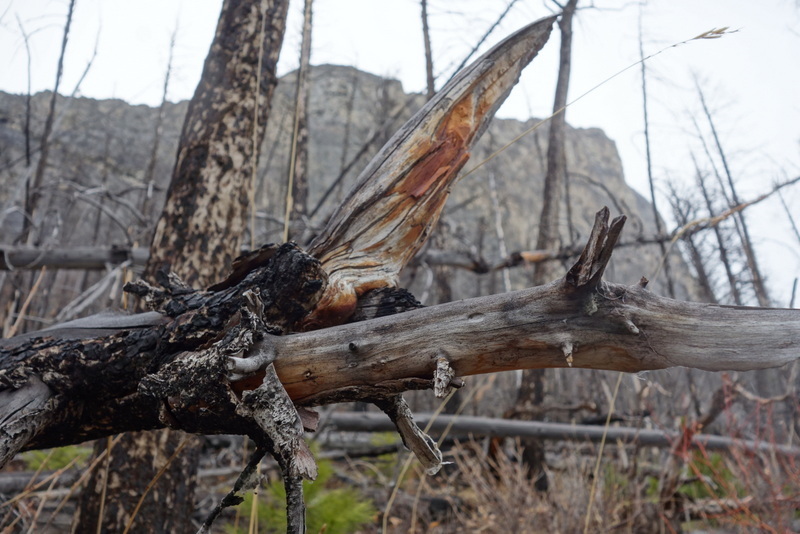 The trail became less and less distinct, crossing old creek beds, tenderly tiptoeing through moss-covered forest, and eventually disappearing altogether. I’d like to come back and push all the way through Devil’s Gap to the other side. A summer project, perhaps. On my way back I encountered this cute little guy, sheepishly standing on a cliff ledge looking up at the trail. Some other hikers told me a large dog had chased him there. Poor guy. 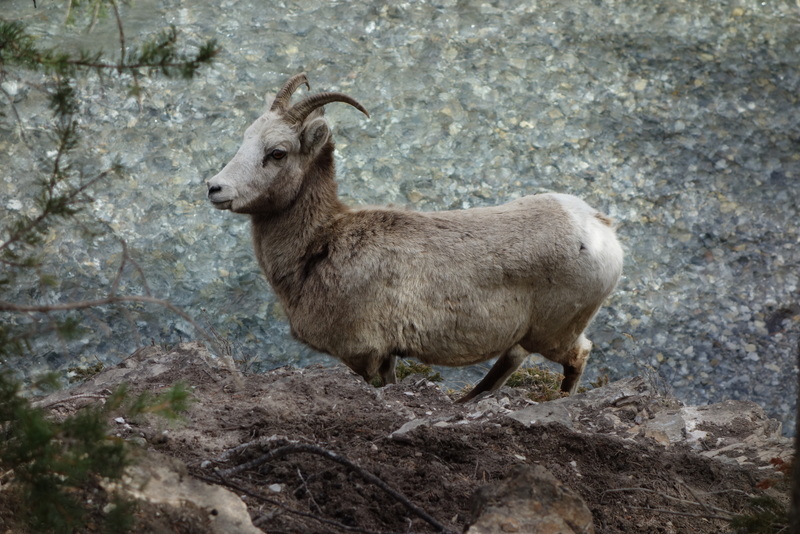 And to make it even worse, on the other side of the canyon was another mountain sheep waiting for him – probably his girlfriend! 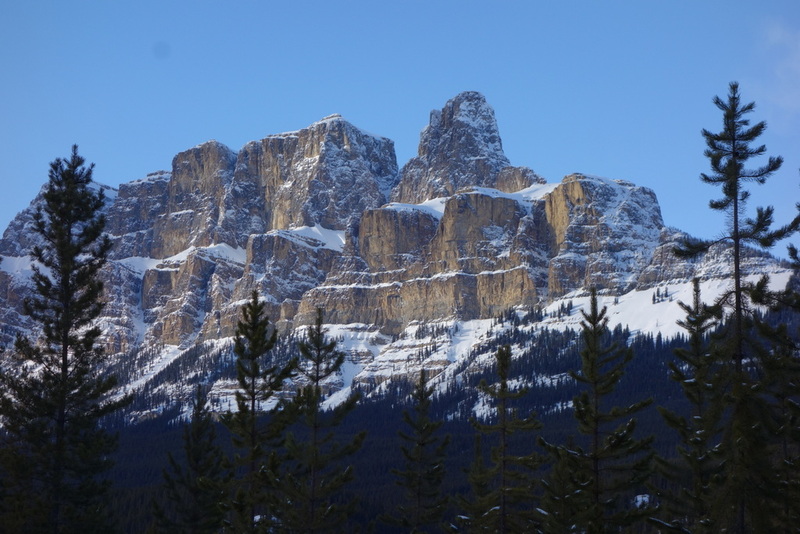 It feels like spring at Castle Mountain. 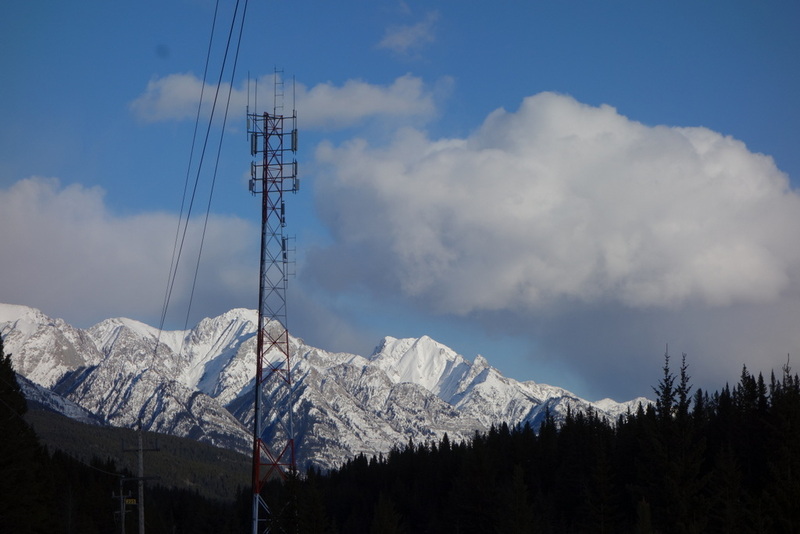 While the mornings are still chilly (-22C last Sunday), it sure warms up during the day. 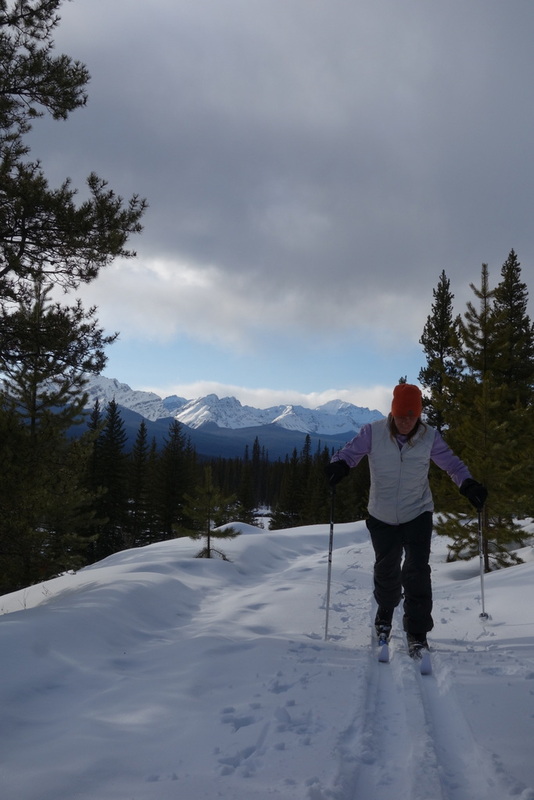 Over two days of cross-country skiing around the hostel and downhill skiing at Lake Louise the sun shone brilliantly and warmed me up even when the air was still cool. A few winters ago I decided to try cross-country skiing. Once I got the hang of it I found it very enjoyable. These last few winters I’ve traveled much of the time and this year I’ve been focused on making the most of downhill skiing. 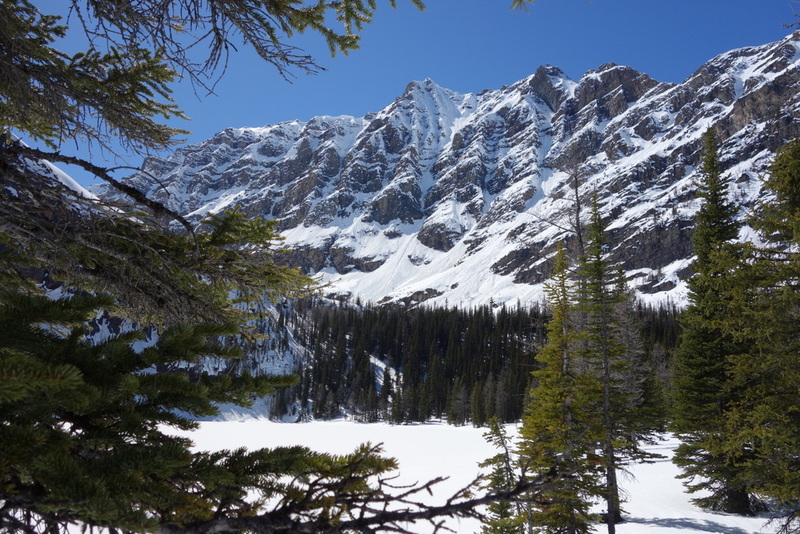 Last week I took a break from steep runs and put on the Nordic skis for a quick glide up to Boom Lake. 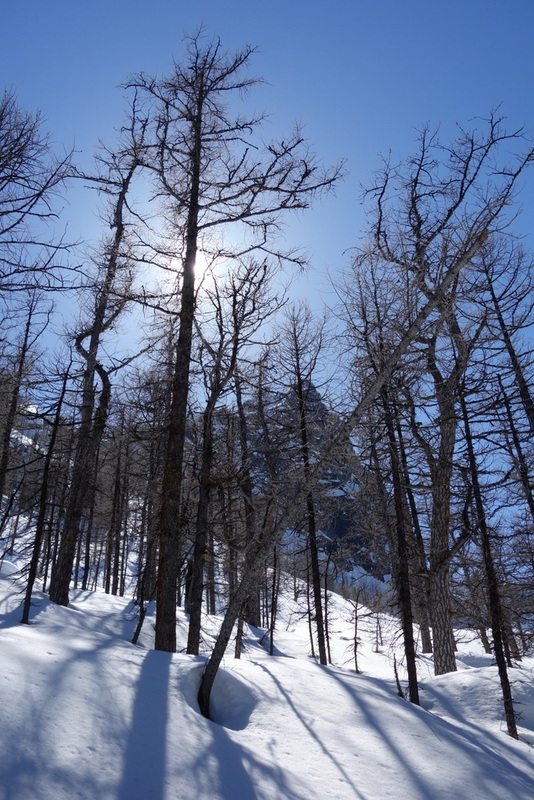 A fresh snowfall covered the well packed trail and the forest sheltered me from the wind. When I got to the lake I was surprised to see that less than an hour and a half had passed. Faint tracks led out along the lake shore so I followed them until they became windswept. Breaking trail was fun but reminded me how much more work it is than following established tracks. 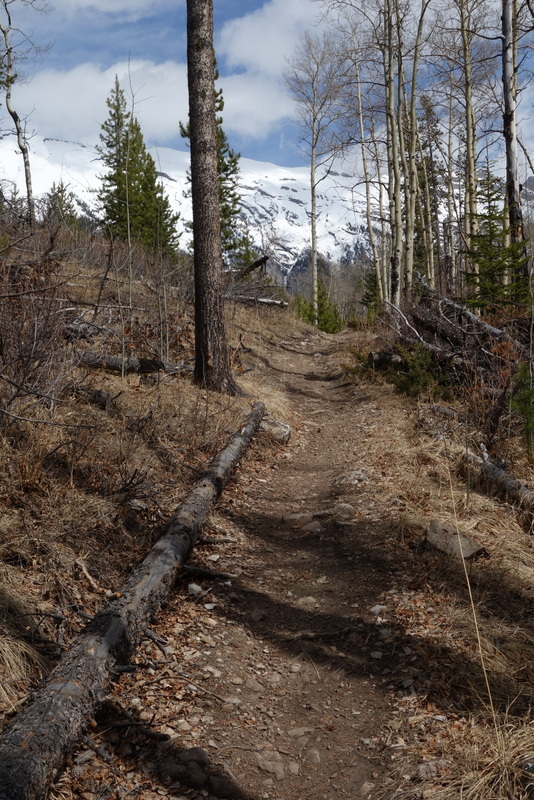 The Boom Lake trail has some pretty steep sections and tight turns toward the bottom. These were great fun on cross-country skis and gave me the chance to take a few really good wipe-outs!